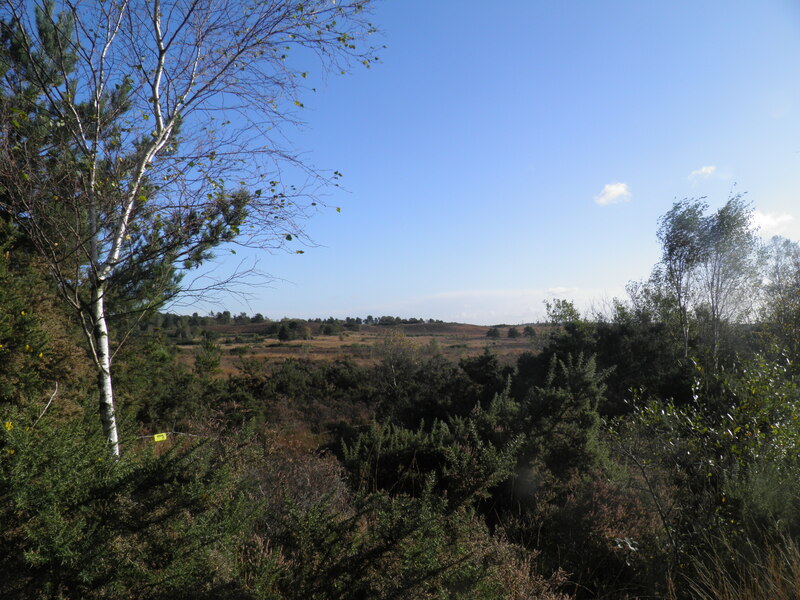 This easy walk takes you through the huge expanses of Chobham Common, the finest surviving area of classic Surrey heathland. Beyond, it ties together woodland, a tiny airfield, remarkable architecture and the site of HG Wells’ Martian invasion on its way to Woking. 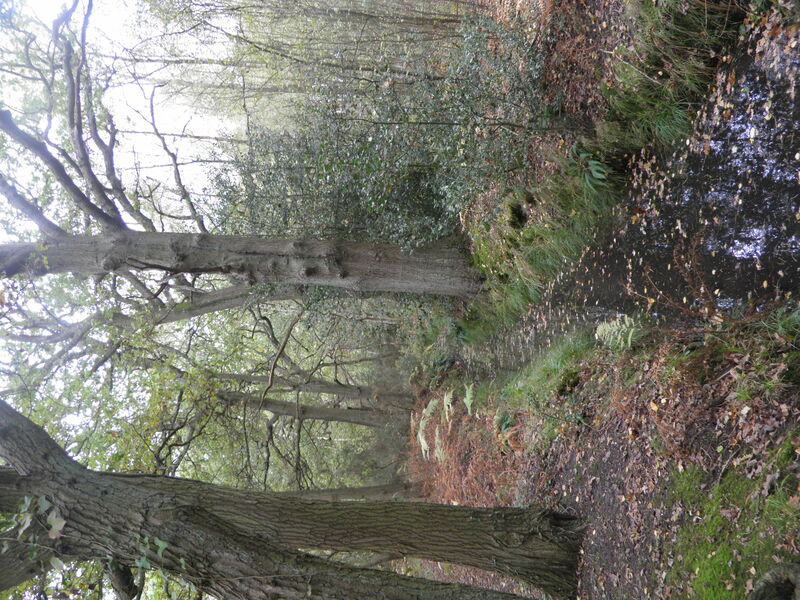 Underfoot: There are a handful of potentially muddy points on Chobham Common and in woodland, but this walk is overwhelmingly firm underfoot and easy going. Terrain: There are no significant climbs and just one brief, relatively steep descent to Albury Bottom. 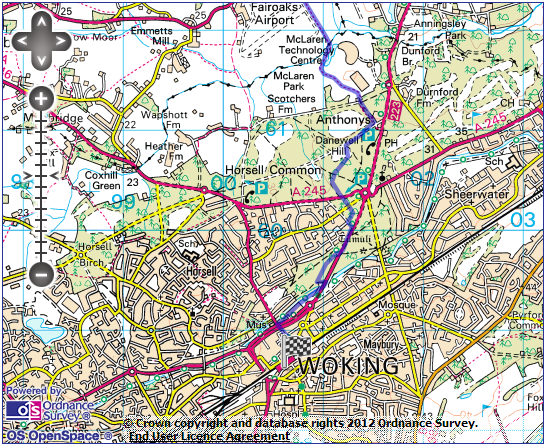 Maps: 1:50,000 Landranger 175 Reading & Windsor and 186 Aldershot & Guildford; 1:25,000 Explorer 160 Windsor, Weybridge & Bracknell and 145 Guildford & Farnham (NB: only the last mile into Woking is on Explorer 145. You should be fine just using 160 and the directions below). Getting there: South Western Railway operate two trains per hour from London Waterloo to Sunningdale (47 mins) via Clapham Junction (39 mins) for London Overground and connections from London Victoria and Richmond (31 mins) for District line. 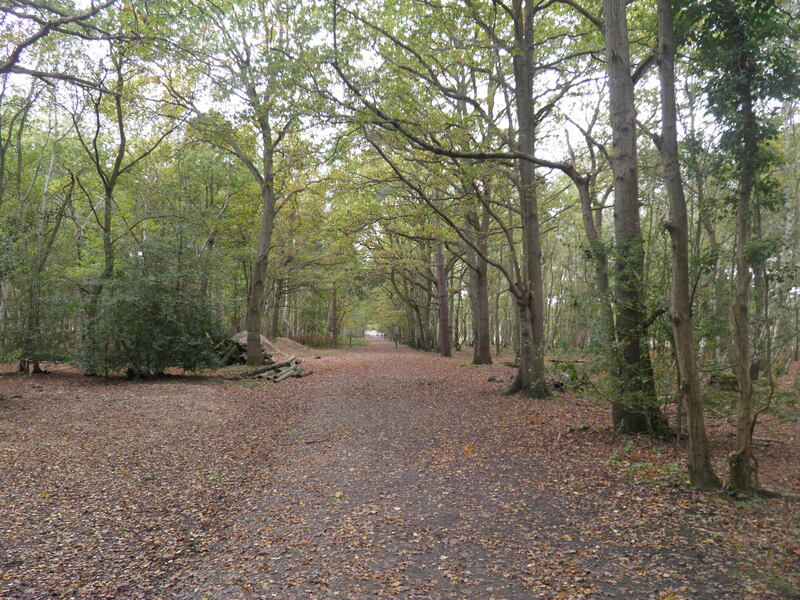 Useful websites: The route crosses Chobham Common National Nature Reserve, passes the remarkable McLaren Technology Centre and Horsell Common. Nearing Woking it passes the Lightbox Museum and Gallery. 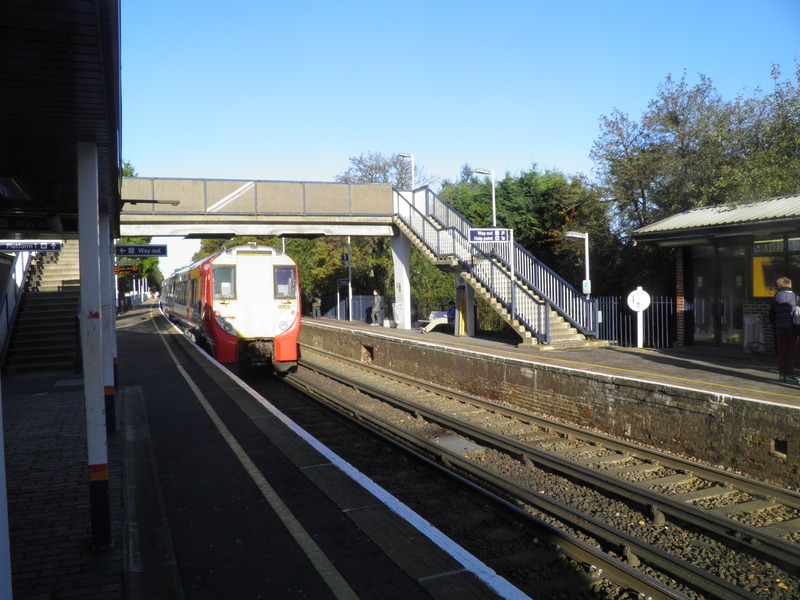 Getting home: Woking has very frequent South Western Railway services to London Waterloo (29-49 mins) – as many as 14 per hour. Around half the services call at Clapham Junction (19-39 mins) for connections to London Victoria and London Overground. Fares: The cheapest option is to purchase an off-peak day return to Woking for £12.80 (£6.40 child, £8.45 railcard) and a Virginia Water – Sunningdale single to cover the last section of the outward journey for £2.60 (£1.30 child, £1.70 railcard). reach the main road. Turn left again over the level crossing. Continue beside the main road, across Broomhall Lane, and a little after, cross at the pedestrian crossing to a postbox that was, at the time of writing, painted gold. This is one of the three postboxes commemorating locally-educated Sophie Christiansen’s equestrian gold medals at the London Paralympics. at a footpath sign head right on a track between fine Edwardian villas. Cross the road ahead and continue straight ahead on a narrow fenced path. Cross a drive and keep straight ahead between fences to reach the B383. Turn right on the pavement, crossing a railway bridge. Just beyond the junction with a road called Richmond Wood, cross the main road to join the track leading onto Chobham Common (bridleway sign). 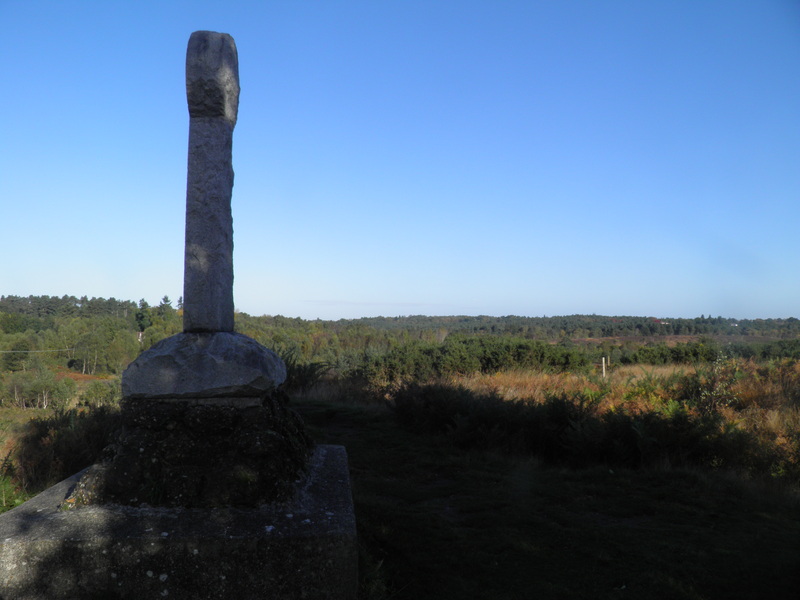 land, the Earl of Onslow, transferred the heaths to Surrey County Council for £1 an acre. Where the track enters an open area beside the railway line, beneath electricity lines, follow the waymarks round to the right, the track now very gently climbing towards the heart of the Common. Pass through a dip with an attractive pond, then the track climbs straight ahead up Ship Hill. Reaching a clear path at the top, by a waymark post, immediately turn right on a grassy path between gorse bushes. You soon reach a clearing, with bench, with a path leading right to the Victoria Monument, from where there is a fine view across the northern part of the Common. commemorating her link to the common: in 1853, she reviewed troops here during what was described as ‘a grand military picnic’. Contemporary records suggest it was something of a washout, with cartoons showing soldiers fishing whilst sitting in their tents. Shortly afterwards many of the troops reviewed, which included the Light Brigade, were dispatched to face even worse weather in the Crimea. Returning to the bench, cross the track and take a smaller path opposite, following a footpath waymark. On reaching a signpost, turn right on the broad, firm bridleway descending. Ignore paths to left and right and keep straight ahead to eventually reach the busy B386. Cross with care and continue on the track straight ahead. underneath it. Emerging on the southern part of the common, take a path to the left at the junction immediately ahead. This stretch of land is cleared of grass and kept mown by the Department for Transport to prevent heathland fires disrupting traffic. The path soon divides – keep to the left hand path, paralleling the motorway. At the next fork, take a narrow right hand path, swinging below little Staple Hill and away from the motorway to reach a small car park and a road beyond. 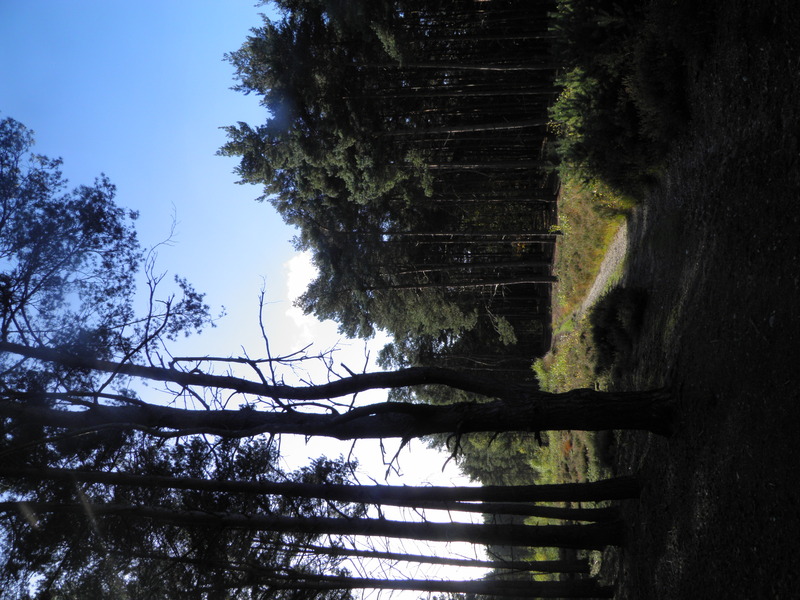 (following the ‘horseride’ waymark) on a clear path dropping through gorse and birch. 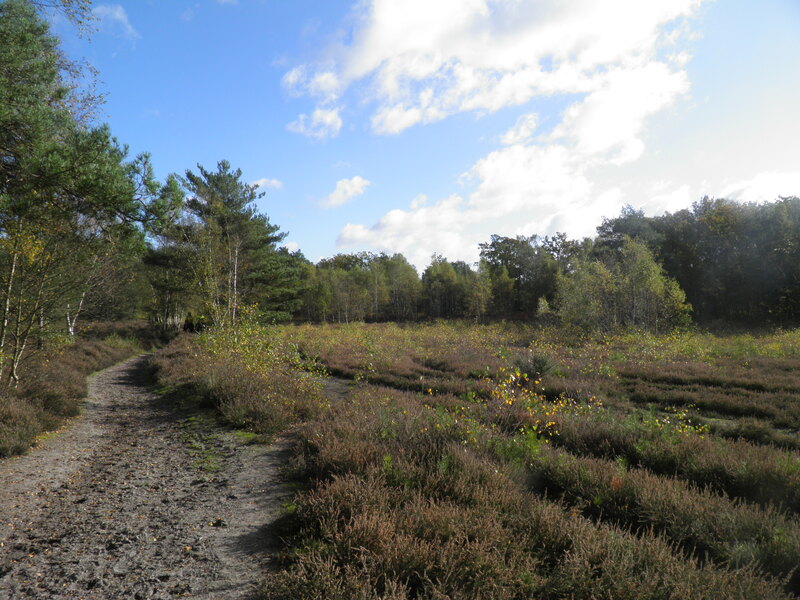 At the bottom of the hill, the path emerges into a remarkable expanse of heathland. At a crossing track keep straight ahead and ignore the waymarked path to the left shortly afterwards. About 300m further on, by a bench at the top of a rise, you reach a further track junction. Here head left and keep straight ahead on this clear track over the dips and hollows of the common for around 1km. Eventually, you enter thicker woodland and cross a bridge by a small pond. At a path junction just beyond, head right (following a bridleway waymark). Pass under a pylon line and enter a belt of firs. You soon reach a waymark post, where you follow yellow footpath waymarks to the right, through the trees. 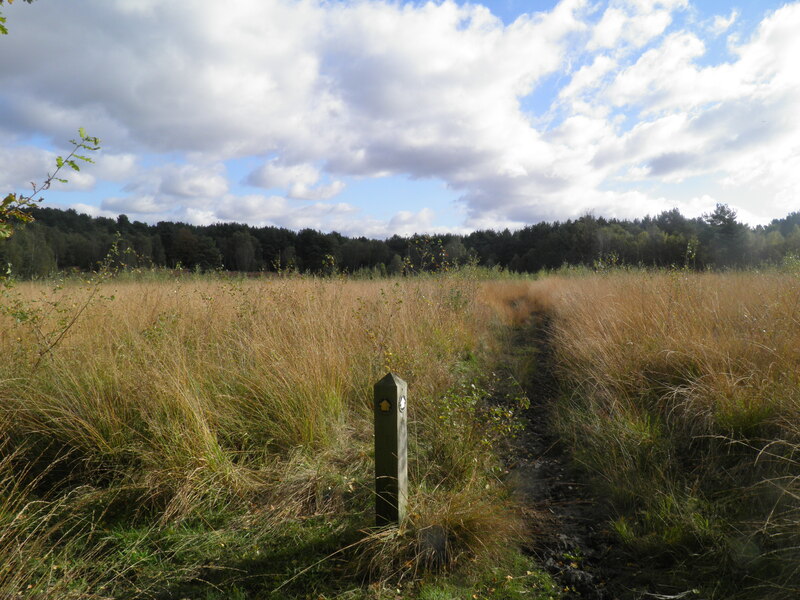 After crossing a clearing, you reach a waymark post showing a fork in the path. Take the lefthand path, meandering clearly through the trees. 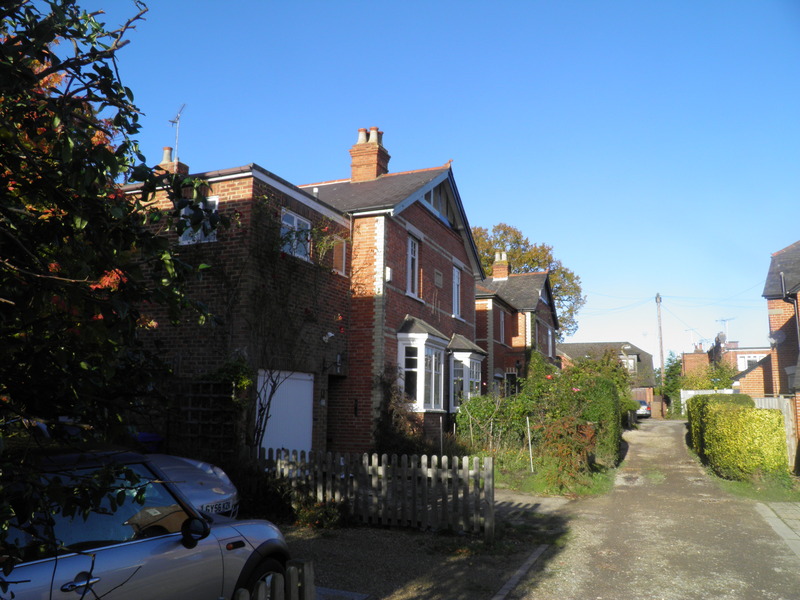 On reaching a bridleway, keep straight ahead, emerging at a road beside a pair of houses. Turn left on the road for around 100m before turning right at a bridleway sign back into wood. Where the path splits, follow a broader lefthand path, climbing slightly (bridleway waymark). The path drops back down through a dip. A little beyond, where the main bridlepath swings left, keep to it, quickly reaching another path junction at the edge of a clearing. Keep straight ahead along the clearing’s edge. Beyond the clearing, the path runs through silver birch trees to emerge at a road junction. Cross the road and follow ‘Bridleway Link’ sign into wood on the other side. Immediately veer L to reach the corner of a garden fence. Walk along the path beside the fence for about 5m to reach a waymark post on the right. Here turn right on a narrow path and at a second post follow the yellow footpath waymark forking L on a not particularly clear, but well waymarked, path through the bracken. grass. At the far side of the clearing, you reach another junction and again follow waymarks straight ahead, now cutting between firs and rhododendrons. On reaching a broad bridlepath, veer left. At a junction, turn right, following Bridleway Link sign, but ignore the second Link sign to the right and continue straight ahead alongside the fence at the edge of the wood. Eventually reach the A319 Chertsey Road. Turn right with care along this fast road for about 100m before turning left on Bonseys Lane (footpath sign). The track runs past houses, with glimpses of the light aircraft parked on Fairoaks Airport’s apron to the right. By Berwin Park the path leaves the track and keeps straight ahead along a line of trees that marks the airport perimeter. Describing itself as an ‘airport’ may be a little over the top, but this single runway airfield can be surprisingly busy with small planes. 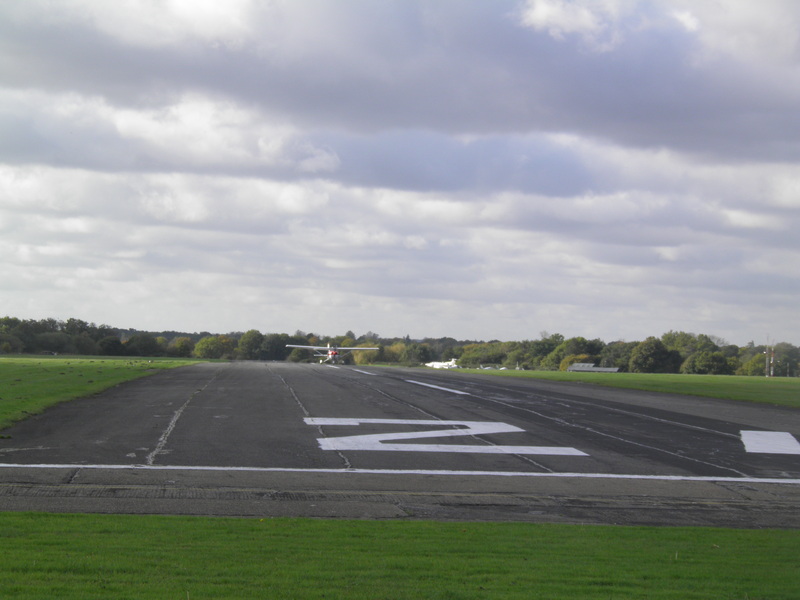 Opened in 1931, and briefly RAF Fairoaks during World War 2, obtaining a hard runway in 1979. Today it serves two main roles: as a maintenance airfield for small planes, and as the base of two training schools, operating light aircraft. The path emerges onto a grassy area at the end of the runway, with signs warning of low flying aircraft. Keep straight ahead, passing the runway end, and beyond the airfield re-enter the trees. Eventually, a footbridge leads you across The Bourne and into McLaren Park. The sweeping, low-slung shapes of the technology centre immediately appear ahead. At a track, head right and follow it as it swings left around the series of reedy lakes in front of the centre. The technology centre is the headquarters of the McLaren Group, including its Formula 1 construction arm. 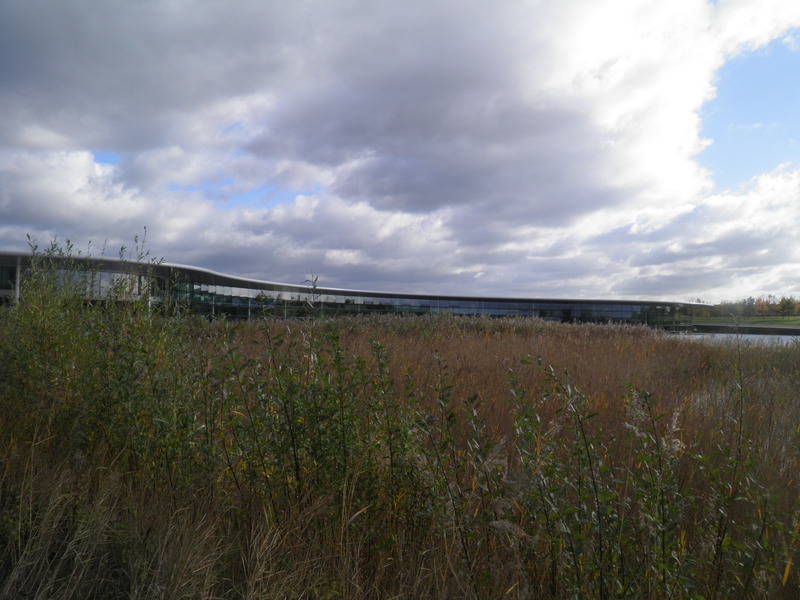 The remarkable kidney-shaped building was opened by the Queen in 2004, built next to a formal lake next to the building and four ‘ecology’ lakes as part of the nature reserve being developed alongside. Water from the lakes is used for dissipating the heat created by the functioning of the centre’s wind tunnels. Designed by Norman Foster, the building was shortlisted for the 2005 Stirling Prize for architecture, eventually being beaten by the new Scottish Parliament building. Most recently, McLaren has built a new production centre for its road cars to the south of the technology centre. production centre t to exit McLaren Park by an attractive pair of cottages on the edge of a wood. Keep straight ahead on a track (footpath sign) to reach a little cluster of handsome houses at Anthonys. On reaching a crossing of tracks, turn right past a green metal barrier to follow the broad, straight track through the trees of Horsell Common. 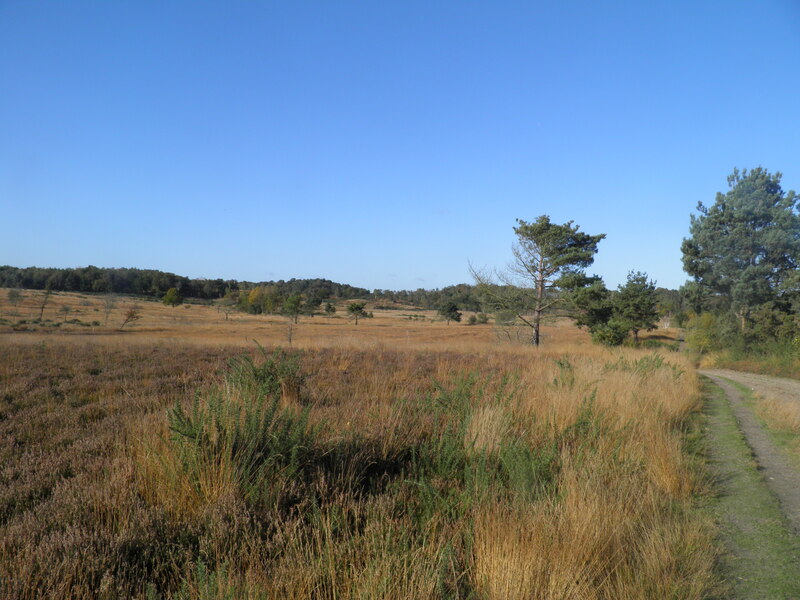 Like Chobham Common, Horsell Common was previously owned by the Earl of Onslow, having previously been part of the once much larger Windsor Great Park. 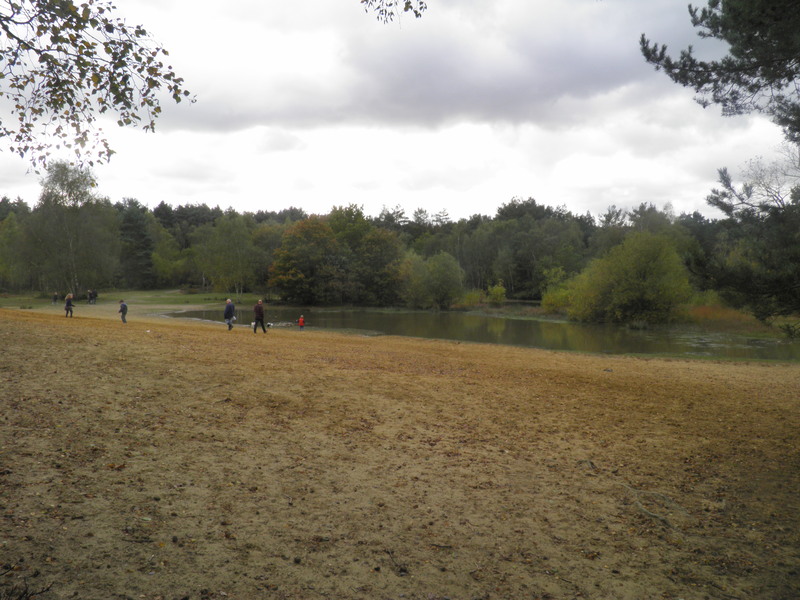 Local residents were permitted to use the Common for grazing and firewood collection, whilst sandpits and forestry provided income for the landowner. 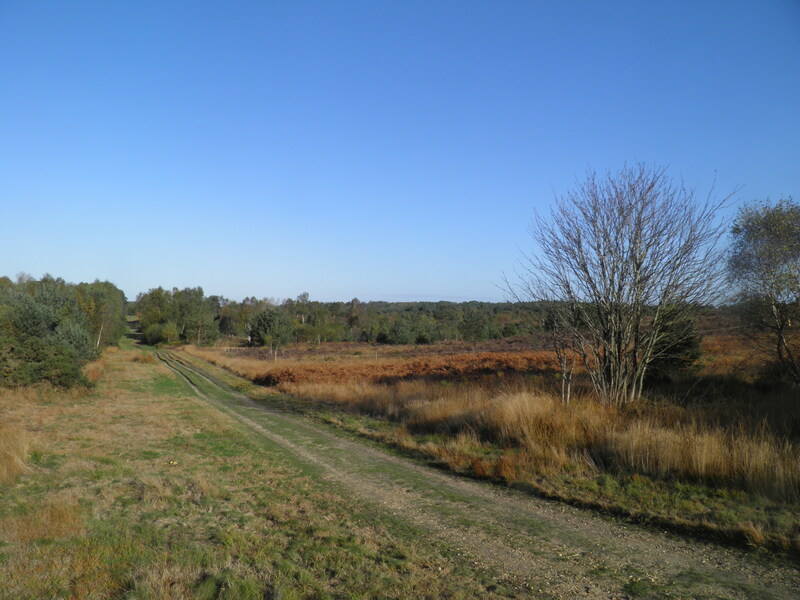 Like Chobham, the Earl divested himself of the common in 1966, the Horsell Common Preservation Society purchasing the freehold. floor of the pits now largely covered with ponds and trees. Of course, the heat-ray soon does for Ogilvy, Woking, Chobham and Weybride as the Martians advance on London. Descend into the floor of the pit and cross the depression – normally walking past the edge of a small pond, though this could be dry, to exit by the first path ahead. Climb out of the pit and keep straight ahead on faint path cutting through the trees. Reaching a clearer path, head left to eventually reach a small car park by the A245. Cross the main road and take the path opposite, which cuts through the trees to reach another, quieter road. Again, cross and continue straight ahead on a clear woodland path. The path emerges on to an unadopted road, opposite Woodham House, with its bronze cupola. Head left to reach the A320. Turn right on the pavement, past Pinewood Close, to turn right on Woodham Rise. After about 30m, just before junction with Foxgrove Drive, head left into woods on an unsigned footpath. You soon reach a fork in the path, where you head left, twisting through younger trees back towards the main road. Where the main path begins to swing away from the main road again, take a smaller path left. Emerging by the canal bridge, head left again up the embankment to rejoin the main road. Cross and turn right over the canal, then head left down steps to reach the towpath. The Basingstoke Canal was completed in 1794, providing a link between the eponymous town with the Thames, linking with the Wey Navigation at Byfleet, a couple of miles east of Woking. Built with the intention of stimulating agriculture in northern Hampshire, it was never much of a commercial success and was soon being challenged by the new parallel railway line. 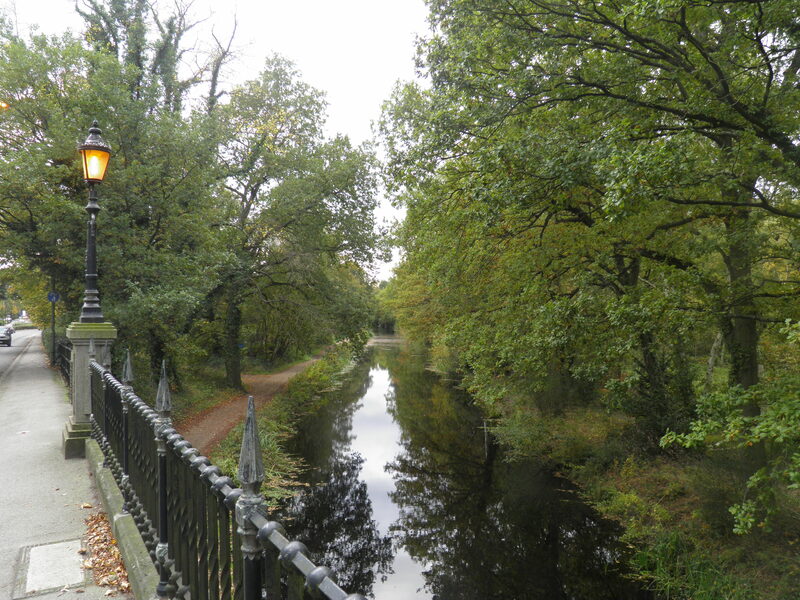 The canal struggled on in commercial use until 1910, although was briefly resurrected during World War I to carry supplies from Aldershot to Woolwich. After a further inter-war attempt to operate the canal as a going concern with a mixture of commercial and leisure uses, it fell into near dereliction in the 1950s. 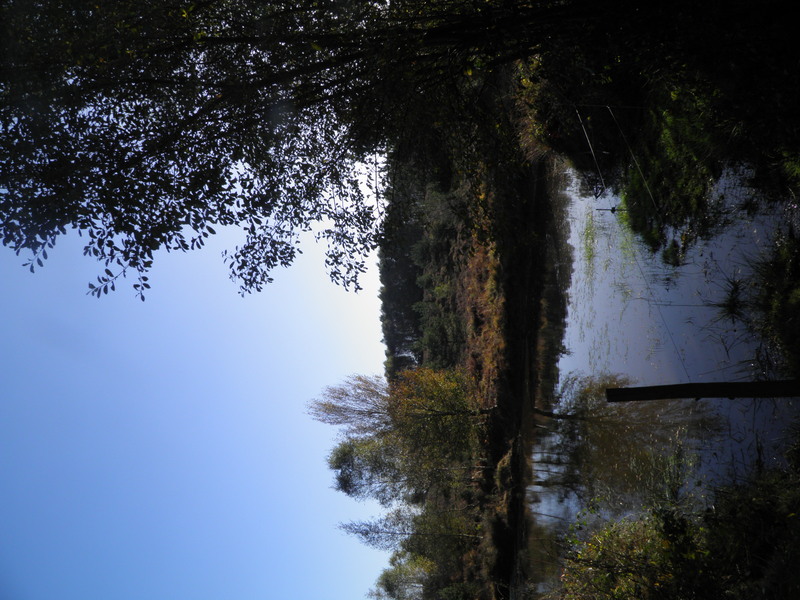 In 1976, the canal was compulsorily purchased by Surrey and Hampshire County Councils and a slow process of restoration began. From 1991, 32 miles of the canal have been re-opened to navigation, from the Wey to Odiham in Hampshire. 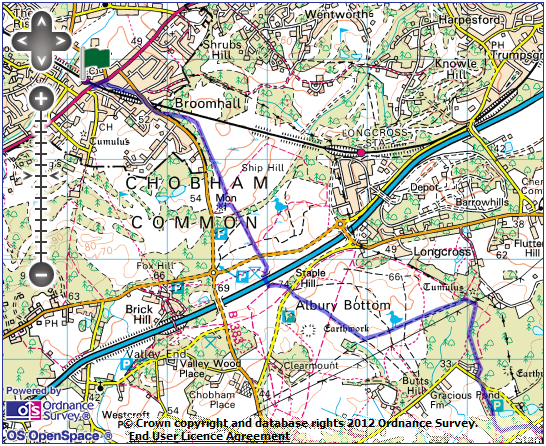 Beyond Odiham, the canal is blocked by a collapsed tunnel, making further restoration very unlikely. Unusually, the canal is managed by an independent council-funded Basingstoke Canal Authority, rather than by British Waterways. Head left along towpath, back under bridge. The canal provides a surprisingly sylvan corridor most of the way to the centre of Woking. pedestrian crossing ahead – you can head right to the Lightbox, a striking modern gallery and museum hosting a range of art and historical exhibitions, with a decent cafe, or otherwise keep straight ahead across the dual carriageway and continue ahead towards the centre of town. 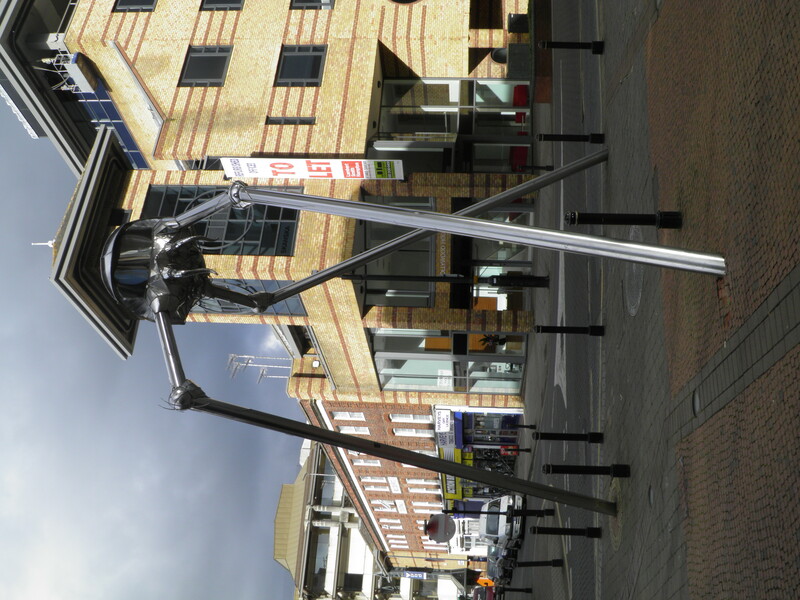 At a road junction by the huge sculpture of a Wellsian Martian tripod (Woking is probably the only town in the world to celebrate its fictional annihilation quite so openly…), keep straight ahead along the pedestrianised street. Past a bowling alley with a plinthed fighter jet outside, at the end of the road head right along the shopping street. The station entrance is at the end of the road, under the large glass canopy. 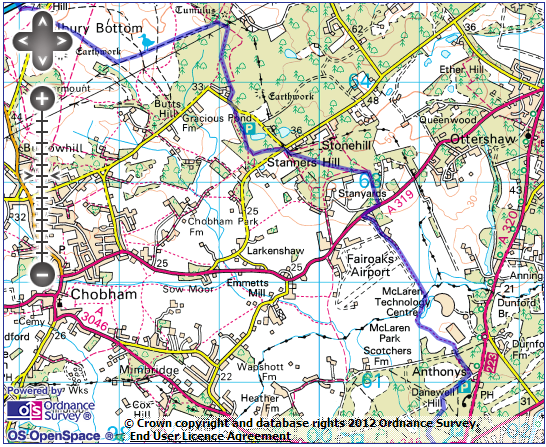 Did this walk today and really enjoyed it, glad I found your website as it was an area of Surrey I hadn’t explored. A few of the way markers and footpath signs mentioned in the early part on Chobham Common are now missing or in a state of disrepair but it’s a credit to the instructions that this caused no problems at all. Glad you enjoyed the walk and thanks for leaving the feedback. I will keep an eye out for missing waymarks when I re-walk this one and edit accordingly!